MESH: Anand Crafts our Tatting Experts are Branching Out! 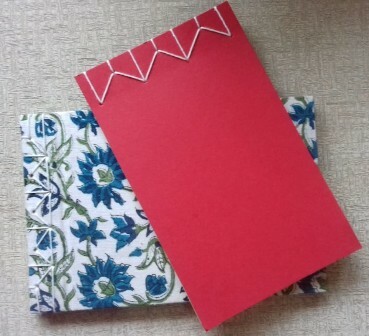 Two members of Anand Crafts are now trained to make bound note books, a new skill to add to their significant expertise in tatting and hopefully one that will fill the gaps when tatting is not in demand. 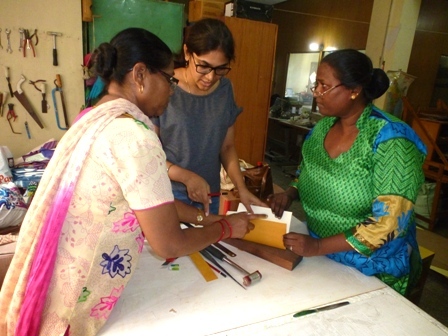 Anna Mary and Shanti attended a five day workshop in MESH Design Studio to learn how to do book binding. From cutting the paper to sewing intricate Japanese binding patterns, they have shown interest and aptitude. Their President, Anita, joined on the first and last day of the workshop and whilst they are struggling to work out a place for working (tatting can easily be done at home and takes very little space) all three women like the products and want to start production. On the last evening they took home some papers, boards, fabric and basic tools and now their job is to do some homework, make these two books (see below) for sale in MESH shop and work out calmly, the costing and pricing. MESH Designer will show them where they can source paper and we expect there will be many more single days of training in MESH Design Studio looking at new designs, mixing and matching colours and materials etc. We are excited at the idea of having note books in MESH shop covered in our own printed, woven and dyed fabrics and hopefully by diversifying their product range the women in Anand Crafts can earn around the year. This is especially important for Anna Mary whose husband died some years ago leaving her with two sons to raise. Tatting has provided vital income for her, and the gaps in employment as tatting demand fell, have been a challenge. This year she has taken an education loan from MESH for one son to complete his male nursing course. Using MESH Design Studio to change lives is our privilege and joy.